While it’s not necessary to use a bench while meditating, some people prefer to use one as they can help you to achieve the correct pose and make you more comfortable while there. They can be especially helpful for those who suffer from a bad back. Meditation benches come in all kinds of shapes and sizes, so it’s best to do a little research before you part with your cash to make sure you’re getting the best option for you. In this article, we’re going to take you through some of the benefits of using a meditation bench as well as some of the things to consider when buying one. We’ll also give you some advice on how to best use a meditation bench as well as show you some of the most popular selling models around at the moment. As mentioned earlier, you don’t have to have a meditation bench to be able to meditate effectively, but it does make things a little more comfortable for you. Sitting or kneeling for extended periods of time can cause a great deal of strain on your back, neck, and knees. A meditation bench relieves some of that strain by helping to keep your back straight while the pads on top give your knees relief from kneeling on a hard floor. When it comes to meditation benches, there are two main designs. The first is what’s known as the I-shaped bench. These benches have legs that sit near the outside and users place their legs in between them. 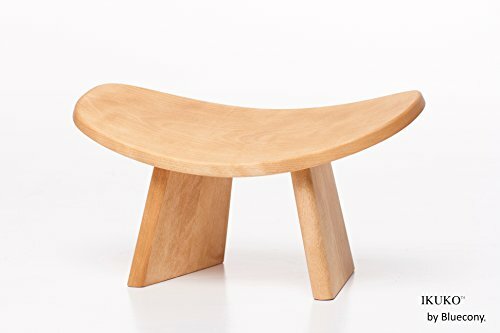 A Pi-shaped meditation bench works slightly different to the I-shaped bench. While they both strive to do the same thing, these meditation benches feature one or two legs towards the middle of the bench, with the user placing their legs either side. Taller users may find using a Pi-shaped bench more suitable as it's easier to maneuver your legs to and from a kneeling position. Meditation benches vary across the board in terms of shape, size, and the material from which they’re made. Be sure to check the weight and height capacity of the bench you’re looking to buy to ensure it’s right for you. Padded or not padded? This is another very important point to consider. Not all meditation benches are padded. And while you can quite easily find a cushion or towel to make it more comfortable, is it really worth the hassle when for just a few extra dollars you can have a padded version? Not all meditation benches are adjustable, which can be a problem if you’re particularly tall or a little on the shorter side. You can always use towels or cushions to help, but it’s not ideal especially if you use your bench while on the move as it’s simply another thing to remember to take with you. Before you make your purchase, just take a moment to consider where you’ll be using your bench. If you plan on regularly transporting your bench then make sure you get one that’s lightweight and ideally fold up. The same goes for if you’re limited for space and only intend on bringing out the bench at mediation time. As mentioned above, there are two main types of meditation bench and in this section, we’ll advise you on how to use both. When using an I-shaped meditation bench the first thing you need to do is get yourself into a kneeling position on the floor. Then, raise your bottom off your ankles and slide the bench underneath you. Finally, adjust the bench as need be until it’s at a comfortable position for you. The most important thing is to make sure your weight is being supported by the bench while your ankles remain flat against the floor, in between the two bench legs. You may find it more comfortable to use a blanket or a meditation cushion to support your legs more. That way you can let your feet hang over the edge for greater comfort. To use a Pi-shaped meditation bench, like the I-shaped model above, start in a kneeling position on the floor, then simply slide the bench between your legs and underneath you. Even though a lot of people find this kind of bench more comfortable than the I-shaped bench, you may still want to consider using a cushion alongside it to provide a softer surface for kneeling on. Once you’re in place sitting on the bench, make any necessary adjustments to ensure there’s no pressure on your knees or ankles and that your upper body is fully supported. Adjust the tilt of the bench until your back is straight and your shoulders are relaxed. Just be careful not to tilt the bench too much as this will put extra strain on your knees. Note: Whichever meditation bench you opt for, just make sure you adjust it so that it’s the right height for you. A bench that’s too low will put extra pressure on your ankles. A bench that’s too high will put too much weight on your knees. If there are no adjustment settings on the bench, simply use some towels or blankets to make it higher or lower. For anyone that suffers from bad knees, height is very important when it comes to meditation benches. It should be high enough to absorb the user’s upper body weight so that less pressure is put on the knees. 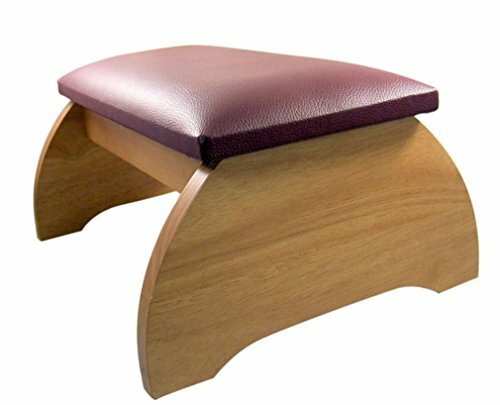 There are meditation benches out there that have been specially developed for those suffering from bad knees or poor posture, such as the Ikuko Ergonomic Meditation Bench (as reviewed below). Just be aware that these benches do tend to cost quite a lot more than your regular, run-of-mill meditation bench. Specially designed by ergonomics and posture specialists to help those that struggle to use standard meditation benches, the IKUKO by Bluecony is meditation marvel. Its aim is to help the user rediscover the natural curve of their spine, and because of the way the bench is angled, it works very well. The IKUKO by Bluecony is handmade from wild cherrywood meaning it’s both strong and beautiful. And because it’s so lightweight and easy to assemble, it’s the perfect bench for transporting around with you. It even comes with its own little (100% organic) cotton bag to make things even easier. The main problem I have with this bench is that it’s non-adjustable. And, while it seems to work really well if you’re at least 5’8, anyone a little shorter may find themselves in need of a few props. 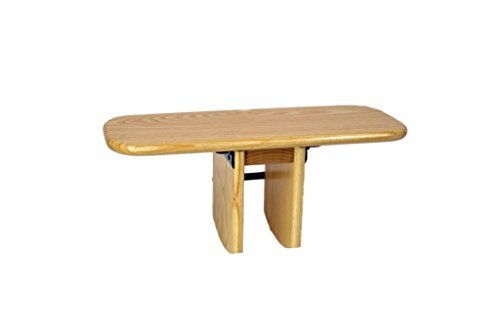 This simple, yet effective, wooden meditation bench on offer from Mudra Crafts is the perfect choice for anyone looking to save a few pennies. But, just because it’s one of the lower end priced models, doesn’t mean to say that’s it’s low quality. Made from natural solid pine wood, this bench is completely stable while in use and likely to last quite some time. One of my favorite things about this bench is the slow shutting hinges. With these, there are no screws to worry about and no collapsing down to be concerned with. The padding on the bench is pretty comfortable and it’s not too heavy either, making it ideal for transporting. You even get some free Mala beads with your purchase! The only real downside I can see with this bench is there’s no way to adjust the height, so beware if you’re approaching 6’ in height. 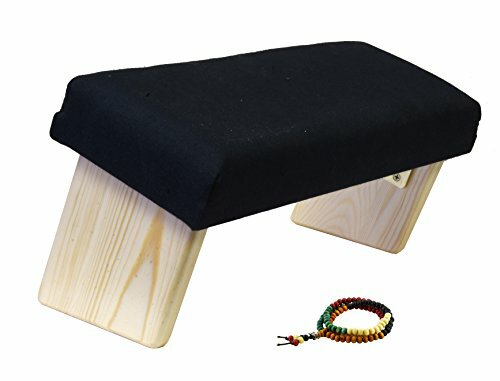 This Maple Hardwood meditation bench on offer from Religious Gifts is one of the most comfortable meditation benches out there (in my opinion). And, it’s possibly one of the most elegant looking also. Available in either a pecan or a walnut stain finish, this bench looks great just about anywhere. The pad is big, and the bench is deep which provides a greater level of support when kneeling. Weighing in at over 8 pounds, and being non-foldable it’s not really suitable for transporting around or stashing away in a tight space. That being said, with it’s high-quality, elegant look, why would you want to? It’s durable, flame-resistant, and not a bad price, so all-in-all, a pretty good buy I’d say. If you’re looking for a highly versatile, highly funky looking meditation stool then be sure to check out the Oriental Furniture Om Meditation Stool. 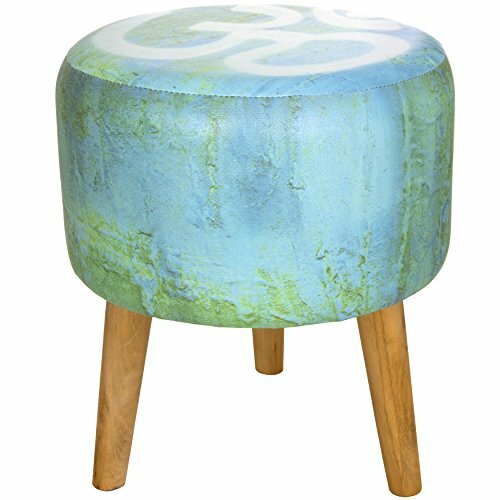 Made using some of the most vibrant yet calming colors, this stool is the perfect accessory for using while meditating. It’s comfortable, it’s calming, and it’s a great price. While this meditation stool is very lightweight, and good for those who have trouble getting down to the floor, it’s non-foldable and a little bulky to be transporting around. But, it is a very versatile stool and can also be used as a seat or a footrest when not being used for meditating. Anyone planning to transport their meditation bench with them regularly should definitely consider this folding model on offer from Pi to Go. Weighing in at just 5 pounds and folding up to a package that’s smaller than most briefcases, this Pi-shaped bench is both easy to transport and a delight to use. As well as the excellent portability factor of this bench, it’s also one of the highest quality benches I’ve seen around. It’s made from selected hardwoods with a poly coat finish to provide extra durability. Being a Pi-shaped model, the legs of the bench are situated in the middle, allowing you more ankle, feet, and calve room. They’re also rounded to enable you to use the bench in numerous positions, reducing pressure from the knees while still providing adequate support. Just be aware that’s there’s no cushion, so those who like their creature comforts will need to provide their own. Being in pain while trying to meditate is one distraction you can do without. Hopefully, through the use of a meditation bench that will soon become a thing of the past and you’ll wonder how you ever coped without one! We hope you found the above article and review helpful and are now just about ready to make your purchase. If you’re still unsure of the model you want to buy, then be sure to take another look at our favorite, the Pi to Go Folding Meditation Bench. It’s both durable and well-made, and it folds down so nice and easy that’s it the ideal meditation bench to take traveling with you, wherever you go. This adventure-seeking Canadian spends his time traveling the world full-time. A trip through Europe gave him a desire to experience the world. His Volkswagen van allows him to go anywhere its wheels will take him. Currently adventuring through North America he is always tethered to the internet which allows him to write from anywhere. His passion for writing sparked his need to document his trip which can be seen on www.gurtthewesty.com.